…debunking christianity…! Lataster…! No Jesus = No God = No Gods…! Lataster: No Jesus = No God = No Gods…! 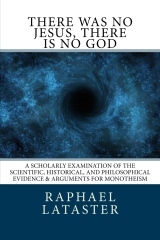 Jesus, There is No God, to be available shortly on Amazon (Kindle version already available). including the existence of God. …i commented: No doubt…! Lataster surely studied hard into historical records of birth (death) certificates of the Romans or Jews of a so called Jesus, and did a thorough study into the Canonicity of the Scrolls of the Dead Sea and others…! I AM SURE some better logic of pure logic, would have guided him better if it did not at all, in his endeavors of the Mysticisms of Old…! And better Bayesian Logic, in reduction to the absurd, from a number of prior assumptions or premises, and or antecedents and precedents…! To not fall into the necesity of negating something more than a Naturalistic Origin, because a endless loop occurs in their minds or logic…! As to Atheism, he must not have read my Book of Pure Logic…! ← …prime numbers search…! VERY BIG PRIME NUMBERS…! the logic of prime "numbErs"…!